Very satisfied. I will keep your number and call if i have other work to get done. We have been very pleased with the service that HKC Roofing has provided our business. Whether it is repair work or new roofing, HKC has been affordable, efficient, and friendly. Their customer service and attention to detail are second to none. I would recommend the HKC team for any job, large or small. I have hired HKC for several projects. Our school and church roofs were over 30 years old and Henry and his crew have been fantastic to work with as we have put a replacement plan in place. They are always timely and very responsive when we have had minor problems with the old roofs. I highly recommend HKC for any roofing project. I like working with HKC because you don’t have to chase them down to do work you have given them. They let you know when they plan on doing the project, and also let you know when they are done. The work is done well and the communication is also good. I have been using HKC Roofing & Construction for the past three years at my apartment communities. I can’t say enough about how impressed I have been with their service and professionalism. Once they have completed a job, I am confident it is done right because I have yet to have them come back for any work they have performed. I recommend HKC to anyone looking for roofing and construction needs. Wonderful job. Henry went out of his way to make sure the job was completed to my satisfaction, going above and beyond-working within my schedule. As a manager of several properties in the Downtown/OTR area, I have been able to count on HKC for all my roofing needs. Their response is prompt during emergencies and their technicians are always courteous and tidy! My properties get the same attention whether the job is big or small. I would recommend HKC to anyone and everyone. HKC was fantastic to work with. They updated my gutters, soffits, and trim around the house. I felt like they listened to my concerns about the house and they gave me several options to choose from. I didn’t feel like I was pointed into a direction I didn’t wan’t to. The guys that came out to do the work were fun to talk to and had no problem explaining the work they were doing and the timeframe it would take to complete. If i had not already replaced my roof a few years prior myself, I would have not hesitated to use HKC for the roof as well. I definitely recommend them to anyone who is looking into this type of service. I wanted to thank you for completing the roofs, coping, and brick wall caps so quickly at Bloomfield Apartments, and Schoolhouse Flats. It is very nice to work with a company that kept to their original quote and time line. Your crews were very professional and did a nice job of cleaning up after they were finished with the project. I’ve hired several roofing companies and HKC has done by far the best job. I hired them to replace my original box gutter (128 yrs old) which was still in place (barely) and had to be rebuilt from the brick out. They were extremely prompt & honest with professional workmanship. All experiences that I’ve had with them have exceeded my expectations and they have even gone beyond the scope of work to correct previous contractor’s mistakes. I will continue to use them and recommend them to all my family and friends. Craig and the team did an excellent job repairing our roof. I got several bids from roofers for our project and they did the best job outlining what was wrong and how they’d fix it. It also did not take them 2 weeks to get back to me, which is helpful when you have a roof that leaks. Would certainly recommend them to anyone and will use them again, if needed. My experience with HKC Roofing has been very positive. Their pricing on quotes has always been competitive, and when they’ve done work for us, they have been extremely easy to work with. Whether it be on the Apartment side of the business, or the Association side, they make things easy for the Manager. They communicate effectively, and do what they say, when they say they are going to do it. I always recommend my Managers request quotes from HKC. I haven’t had any issues with them on any project they’ve done for me. I felt very confident with the service and product. Excellent communication and professionalism. I saw your ad on tv. Salesperson was prompt and courteous.Workers came and did the job-no messing around. My gratitude for the fabulous job on our roof. Neighbors were jealous that their crews threw scrap on bushes and lawns, while your crew filled a trailer from above. At the end of a 12 hour first day, everything was clean and tidy. Also, your salesman’s involvement did not end after i signed the deal. Project was an extensive roof system. Could have become a money pit, but instead, a successful purchase. Henry had two teams on site and was available for all of my questions and concerns-all of which were resolved promptly. It was a great experience. I have used hkc before, and will continue to do so. Henry is a true professional-the job always gets done and looks good. I was very happy with all of the work done. I have recommended your company my fellow walmart employees. Please send me some more of your business cards. Sales representative was very professional and his presentation was excellent-it encouraged me to use your service. Your commercials caught my attention. Paul, the sales rep., is the man that made this job happen. He worked well with me and my insurance company. The work crew’s professionalism was outstanding. I was impressed with them and the salesman, paul. I am carrying your business card in my wallet to give out to those who might need roof work. The team was organized and worked very efficiently. The downspout repair team was prompt and informative. We have hired HKC twice in the last couple of years. We met Ed Stinson at the Cincinnati Home Show at just the right time – we needed a new roof on our house. Ed explained all the options and provided enough info for us to feel like we were making an informed decision about the best roofing system for our home. Price was fair, installation was excellent, and the house looks better than ever! More recently, we had a tree fall against the side of the house and damage the siding. Again, Ed came through with great service. The color match, installation, and quality of work were excellent, done in a timely manner, and the price was fair (right on track with our insurance estimate – how often can you say that??). It sounds funny, but I hope I don’t need to call these guys again anytime soon, but if the need arises, I will definitely call HKC. We hope you do as well! I hired Henry from HKC to replace the flat copper roof over my bay window because I knew I could trust him to use traditional, old-world repair methods on my historic home. The craftsmen that performed the work exceeded my expectations in terms of quality, professionalism, and cleanliness. Furthermore, the price for the work was surprisingly reasonable. There is no other name you need to know if you are in need of a high quality roof replacement or repair. I interviewed several companies-some higher, some lower. I felt that your product and materials met my needs and price range. Thank you very much for a job well done. Your salesman was one of the finest representatives that we have ever worked with. It was a pleasure to deal with him. 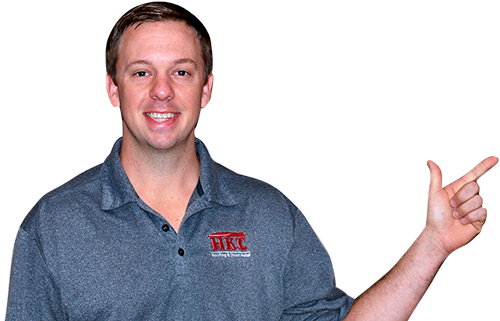 I am a project manager for a property rental company in the Cincinnati area and recently started using HKC Roofing. Very knowledgeable, very thorough and very good company to work with. Last year an HKC rep, Henry, suggested a creative solution to a unique roof issue we were experiencing and it did the trick. Will definitely use HKC in the future and would recommend them to anyone out there. We had an emergency and you were quick to respond. Dan was very nice and helpful-he did a proper installation. I called HKC Roofing to do some duct work for my microwave’s ventilation. When Craig got to my house to provide the quote, I noticed right of way his friendly and honest nature. Very easy to talk with and he took his time getting to know me a little bit. Once we reached the microwave he quickly noticed that the model may be capable of self-ventilation. He took the time to read the owner’s manual and installation instructions to verify my microwave’s capability. What shocked me the most was that after his verification on the manual he called the customer service line for me and helped me get the parts I needed from the microwave manufacturer. It ended up being a no quote this time around for Craig, but he definitely gained a future customer. I greatly appreciated his professionalism and sincerity, and it is not something I have been very familiar with when requesting a quotation. HKC truly showed me that they want to provide me with the best outcome even if it means they will not receive the order. For putting my needs first, HKC has earned my trust and made a future customer out of me. I will definitely be calling them again, and I strongly recommend to anyone that reads this to consider them to at least provide a quote. You will be impressed and appreciative of their ethical approach to serve you. The opportunity is yours, customer service like this is not common. A very thorough, neat, and professional job! Well done. The roofers worked crazy hard, from 7:00 am to 9:00 pm. They were polite and fast. Sales staff was prompt and knowledgeable. The boys did an excellent job for me. The salesman was great to do business with, and a big help to us. Keep up the high standards. Very pleased with your work and your staff. Neighbors told us how well the job was handled while we were not at home. We have recommended you to everyone. HKC Roofing has exceeded every expectation on each occasion they have performed work on our luxury residential high rise condominium. HKC has gone the extra mile locating the source of water and solved several very unique water intrusions. I would use HKC Roofing again without hesitation and would highly recommend them to others. Russ Dieterich CMCA, AMS- Building Manager, Towne Properties. First saw tv ad. We were very confident in your company after speaking with henry. We have been pleased with all aspects of the work done.